Most people only do the bare minimum for their oral health — and as a result, they are likely to experience various dental issues over the course of their lifetime. Tooth loss, gum disease, and other problems are all too common as we age. To prevent them and keep your smile healthy, your dentist in Temple advises you don’t skip out on these 5 habits. 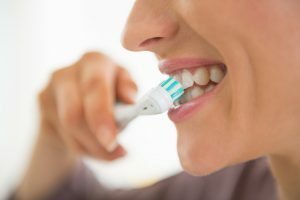 People who don’t manage to brush their teeth twice a day are often skipping the nighttime session. Maybe it doesn’t feel all that crucial to clean before you go to bed, but if you don’t, you are allowing acids and bacteria to run wild in your mouth at night. When you sleep, you do not produce the same amount of saliva as you do during the day — and that makes it more difficult for your mouth to wash away the substances that cause tooth decay and gum disease. Make it a habit to brush your teeth for two minutes before you go to sleep. And after you have brushed, take the time to floss between your teeth, too. Dental floss isn’t optional for healthy smiles — it is the only way to reach between the tight spaces where your toothbrush just can’t touch. You should be flossing gently at least once daily. There is a reason it is recommended to visit the dentist for a checkup and cleaning every six months, and it is not just because your dentist loves to see you. When you have your teeth and gums looked at regularly, issues can be detected before they develop or soon after the fact — allowing them to be treated as conservatively as possible or prevented altogether. One excellent “smile hack” is to get in the habit of popping a piece of sugar-free gum in your mouth after or in between meals. This will stimulate saliva production to help wash away bacteria and food particles, protecting your teeth and gums from common oral health issues. And the refresher for your breath isn’t bad, either! If you play contact sports or grind your teeth at night, you should be careful to protect against broken teeth or dental injuries by wearing a customized nightguard. Sports injuries are the most common cause of dental emergencies, and nighttime teeth grinding and jaw clenching can cause the teeth to become weak or worn. There you have it — 5 important habits for keeping your smile healthy at any age. Keep these in mind and you’ll enjoy better oral health for a lifetime to come. And that’s worth so much! The Fossum Dental Group offers full-service dental care from the comfort of their state-of-the-art dental practice. From checkups and cleanings to complex tooth replacement and more, this team of experts does it all. To learn more about keeping your smile healthy or to schedule an appointment for excellent care, you are invited to contact the office by calling 254-778-3900!